LIBERAL, Kan. – Following a weekend trip to Las Vegas, the No. 9 Lady Saints volleyball team returned to the Greenhouse Wednesday night, sweeping Butler 3-0 (25-22, 25-18, 25-14). The Lady Saints have now swept four straight Jayhawk opponents. The Lady Saints (16-1, 5-0) came out with a bang to start the match, going up 7-3 following a Briana Domino kill. Momentum quickly changed however, as the Grizzlies fought their way back into the match, taking a one point lead following a block by Aliyah Bernard. Down 10-11, a block by Luz Sierra jumpstarted a 3-0 run for Seward. The Lady Saints could not hold onto the lead, however, as three straight Seward errors brought the set to a tie at 18-18. 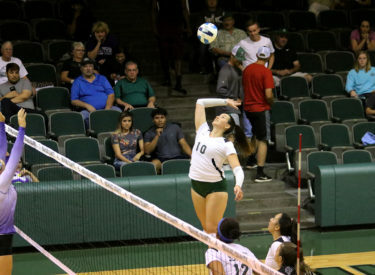 The remainder of the set belonged solely to the Lady Saints, as they won seven of the next eleven points, capped with a Mariana Nascimento kill. Set two began identical to the first, with the Lady Saints jumping out to a 7-3 lead. The Grizzlies closed the gap midway through the set, coming within two points following a Brooke Fender kill. The two-point gap was the closest that Butler could get to a lead, as the Lady Saints extended their lead to seven following a 6-3 run to end the set. The run, capped by a Domino kill, gave the Lady Saints the set two victory, 25-18. The Lady Saints never trailed in taking the third and final set. Seward scored four of the first six on two Giovanna Tapigliani kills. The final set was one of runs, as the Lady Saints quickly closed out the Grizzlies thanks to runs of 5-2, 8-3 and 6-1. During the 8-3 run, Luz Sierra accounted for three kills, giving the Lady Saints a 15-7 lead. The set ended 25-14 following a service error by the Grizzlies, giving the Lady Saints a 3-0 victory. Three Lady Saints – Domino (10), Tapigliani (10), and Viviane Viana (11) – finished the match with double digit kills, while Nascimento was one shy with 9 kills. Tapigliani was efficient with her attacks, hitting .500 on the night. As a team the Lady Saints hit .339 with 50 kills, a season high for a three-set match. Giovanna Kuntze tied her three-set match high with 37 assists, as the team finished with 43. Three Lady Saints – Domino (13), Kuntze (10), and Nathiellen Machado (10) – finished with double digit digs, while Viana came up one shy of a double-double with 9 digs. The Lady Saints get a two-day break before heading to Colby, Kansas to take on the No. 20 Colby Trojans at 2:00 p.m. on Saturday.